I recently wrote about Detroit's turnaround and how the Motor City has rapidly transformed itself. 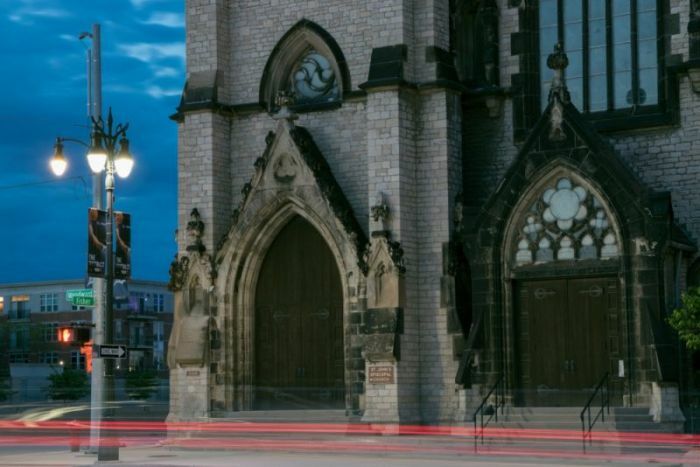 Originally built in 1889 for First Presbyterian Church — at the time Michigan's oldest Protestant congregation — the cruciform-shaped edifice, built of beautiful Lake Superior red sandstone, is Detroit's finest extant example of Richardsonian Romanesque architecture. First Presbyterian Church-turned-Ecumenical Theological Seminary is the work of George D. Mason and Zachariah Rice, better known as the Mason & Rice architectural firm. The duo is credited with countless churches, private residences, train depots and even the iconic Grand Hotel, also known as America's summer palace, on Mackinac Island. For me, the interior, notwithstanding the Tiffany stained glass windows, isn't the draw. Rather, it's the exterior, if only because stellar examples of Richardsonian Romanesque are few and far between, at least compared to much more ubiquitous examples of Gothic Revival. Your eyes will undoubtedly be drawn to the bold arches and massive central tower. Instead of focusing on the façade at the west front, go to the south side of the church. That's because a circa 1930s widening of Woodward Avenue, itself an iconic Detroit landmark, forced the relocation of the three-bay porch to a side street. The porch features ornate carvings that desperately need conservation after decades of exposure to Michigan's harsh elements. Founded just before the Civil War under the patronage of Henry Porter Baldwin, who served as governor of Michigan and as a United States senator, St. John's includes an antebellum parish church that today serves as a chapel. A much larger, circa 1861 church overshadows the otherwise quaint but somewhat rudimentary Gothic Revival chapel. The parish church, which is also opposite of the ballpark used by baseball's Detroit Tigers, is Victorian Gothic Revival at its finest. Massive by today's standards — some cathedrals are smaller — the physical size reflects the population and wealth it once served. Personally, I'm rather fond of the bell tower at the church's northwest corner, though to appreciate the architecture you need to view it from the parking garage across busy Woodward Avenue. Another gem is found in the apse with the magnificent ad orientem high altar and its mosaic reredos.